Recently, I decided to conduct a Google experiment and write down what the search engines suggests for the phrase "why are" followed by all kinds of nationalities, races, and localities (alright, "recently" seems to be last March, as evident from the Google theme, but I only decided to post this now). I did this just for fun and found most of the results funny, some hilarious, and some offensive and controversial. However, all of them have a reason for being there – statistics. It's what people search for. The cream of the crop. Stereotypes, hilarities, it's all here. If you can, please don't take them too close to heart. In fact, if you're a righteous conservative thinking of lecturing me, do me a favor and close this page now. Afraid of the dark? – I didn't know that, thanks Google. And the women… true again. I can attest to the rude part. Have you seen a non-weird Japanese video? The truth is there somewhere. This one was frankly news to me. Poor Polish people. Indians are afraid of dogs? I've never seen a non-hairy Armenian. And something more generic, without comments. Funny stuff. "Why are French" has also some interesting stuff. It seems the majority of results from any "why are" is negative, though, why so? Damn, how did I miss the French? And yeah, most are negative unless it's about how hot the girls are. 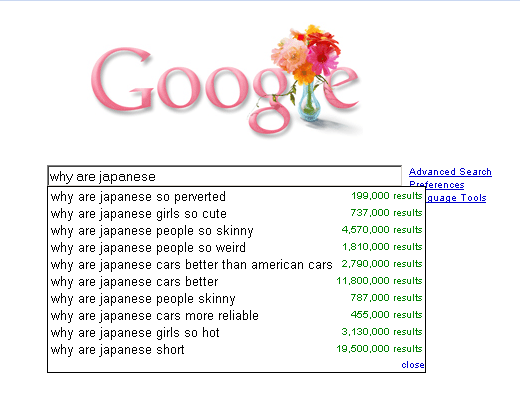 It's what people are searching for – the next one should be "why are people"… eh? I really enjoyed this post. It got me to open another tab and try it out for myself. I actually learned something. One thing I didn't know potatoes are bad for dogs. And one that made me go huh…. why are politicians called honorable. tnx, this is so funny.
.: 89 queries :. : 0.164 seconds to generate cache :. : nexus2 :.